Jawir has a gun to the girl’s open mouth. Her name is Ika. She’s seventeen. We’re at a table of cheap rings in Fatahillah Square, north Jakarta. A piece of A4 reads: Engrave your name on a ring for Rp 5,000 ($0.60). Another reads, Terima tindik: get pierced. Jawir, the piercer, squats on the grey flagstones with his bare fingers in Ika’s mouth. She’s wearing a red t-shirt with the slogan: couple of lover, and holds a cigarette. Jawir wipes a yellow piercing gun with a square of cotton wool, then punches a piercing stud through Ika's lower lip. School’s out for the summer, and three seventeen-year-olds are spending the day in Fatahillah Square getting face piercings. “Yes, our parents will be angry,” Dede admits. She has just had her nose pierced. “I am,” says Bella. She has tiger-eye contact lenses. “Our parents will be angry today, but less so tomorrow,” reasons Dede. The girls laugh. Ika’s piercing is not finished. She draws on her cigarette. 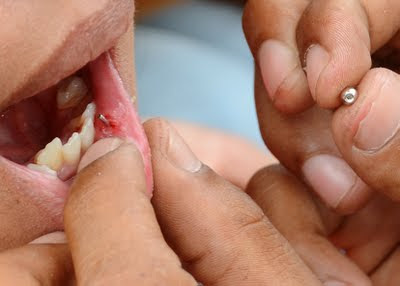 Jawir fiddles at her lip and pulls the piercing stud out. Ika spits on the ground. Jawir takes a curved barbell and threads it through the hole in her lip with his fingers. Ika winces. “She wants to cry,” a lady shouts out from the crowd of spectators. 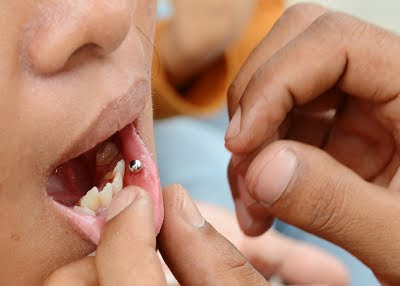 With his fingers inside her mouth, Jawir locates the end of the stud and screws on a ball. Ika squeezes her eyes tight shut. Jawir has been a piercer for one year. The girls gasp and giggle at the question. Jawir shakes his head. “Just the tummy button. Most people want tongue and lip piercings." 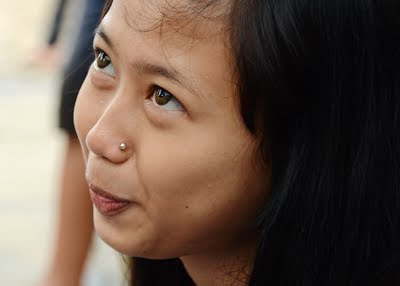 Jawir charges Rp 15,000 ($1.60) per piercing. “But Rp 20,000 if it’s a tongue piercing,” he adds. Jawir has only a single stud in his ear. I like his answer at the end. Obviously my first world sensibilities are screaming - but what about the hygiene!?!? 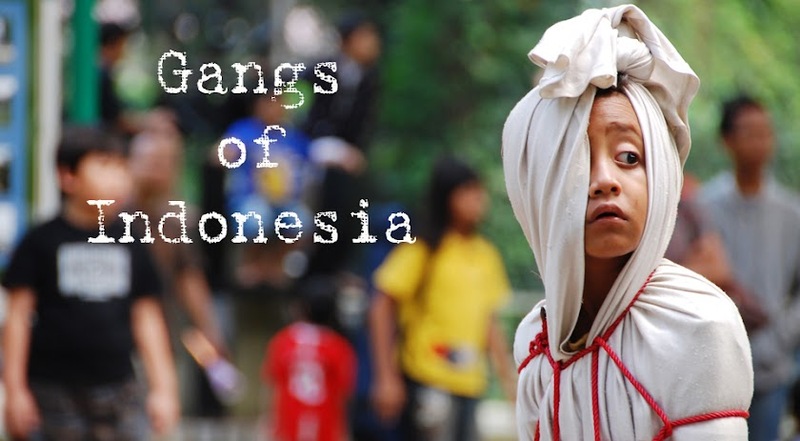 In Indonesian, 'gang' means narrow street. These pages take you with me through the streets of Indonesia.